We'll probably end up seeing these in the States in a year. Just enough time for me to find more space in my home office! As I mentioned in the Marvel thread, I asked a friend currently based in London if he could check to see if Forbidden Planet had any in stock, and he ran right out and subscribed! Which, I suppose, means I can start looking for packages in the mail, eventually. Also means I will have some figures I don't want. . . The collection is supposed to be finally launched nationally in the UK in the next week or so. Picked up a Batman and Superman during the trial run and was pretty impressed so I subscribed. I'm really eager for this series to start. I'll look for some when I'm in Europe later this year, but I'm also going to be checking DCBS solicitations pretty carefully, too, for the next year. Wonder Woman is not part of the first wave, correct? Wonder Woman is supposed to be issue 7 of the collection. You guys may have seen this already, but here's a TV ad for the figurines. You can see WW in the set. Man, this is a tough decision. I really like the look of these, but I don't want to end up buying all of them. (Plus I don't have a lot of room to display them). Maybe if I just stuck to getting the Heroes.....then, what's a group of heroes to do without villains to fight.....arrrgh! Pardon me whilst I weep softly in the corner, here. For you French guys, it started also? Now are these really available at newsagents? Over the past couple of years, I've popped into a couple dozen magazine shops in London, and I've never seen them on display. The only place I've ever found these in the U.K. is in comic book shops. 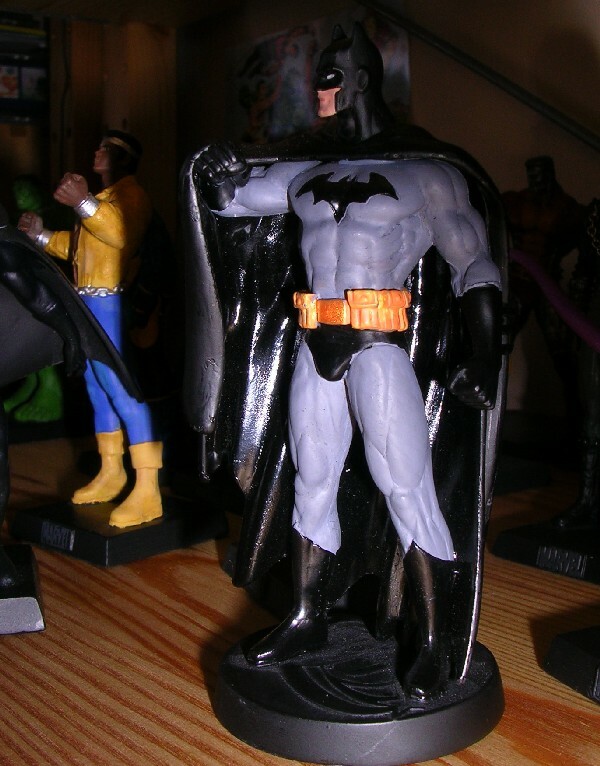 Caution : I found quite a few Batman figures with bent ears. Look well before buying. Now are these really available at newsagents? That was the case for Marvel figurines in Ireland. Probably will be the case for the DC ones too. During the trial run in the autumn last year these were readily available in several newsagents and supermarkets in my area. Has anyone received the subscriber exclusive Batman figure yet? If so is it any good? Photos look good. Batman is out for €2.99. I may take the jump. Does anyone abroad want me to buy and send an extra one? I've just bought it. Nice heavy stuff. The problem is that the price gets higher for each new figure. And I'm not sure about the deals they propose afterwards to keep you going. So it may be my first and last one. "Does anyone abroad want me to buy and send an extra one? " Okay, I got Batman last week. 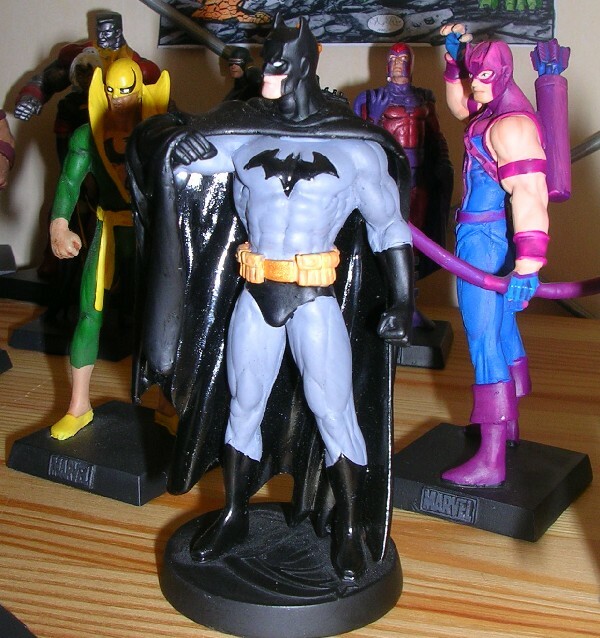 Very nice figurine, very beautiful sculpt, the paint is good but I will give it only a 7/10 (the yellow paint of the belt is my only concern, since my Batman got a bit of yellow on the belly - hem sorry the lower abdominal muscles). Batman is bigger and taller than Cap, for example, but he is the same size than Hawkeye (by the way, since when is Clint Barton taller and more muscular than Captain America ?). The good surprise (imo) came from the magazine : no more humour, well written, the only thing I regret is that you don't have any poster inside ! There is a special chapter on the Frank Miller's Dark Knight and the Miller Mazzuchelli run on Batman Year one. I will continue the collection, of course, but I will not get all of them. I will send some pics . After the excitement of the new magazine format, I regret some lacks of informations about the character. There is a chapter on the Batman's equipment (Batmobile, motorcycle, batarangs...) but none is said about the Batcave and the utility belt !!! There is also no "technical" informations about Batman's physical performances and intelligence (the kind of power grid there is in the Marvel magazine). After I posted some pics, due to the zoom effects, I noticed some flaws in the paint of my figurine that I hadn't noticed before. The flesh paint is not so well applied on the face, but you really have to put your nose on it to notice. But I had already encountered this kind of "disagreement" with almost all my Marvel characters wearing this kind of mask (Cyclops, Wolverine, Captain America, ...). I know the first figurines are produced in great number, so it's understandable the quality is not 10/10 at the beginning. The latest Marvel figurines I've got are really amazing in detail and paint job (Hawkeye is a must !!!). Do anyone here know the quantity of figurines which are produced per character ? This one strikes me as a bit off, not unlike the Guardian one posted in the MFC thread. The Marvel ones so far were really good and with minor differences (I wouldn't have thought Hawkeye or Yellowjacket as muscular as, if not more than, Power-Man for example) almost on model. This one appears too muscular. I like my Batman. My only concern is that two different blacks were used : The boots, chest bat emblem and inside of the cape are painted shiny black the outside of the cape, gloves, shorts and mask are mat black. My figurine has the same type of black than yours Philippe. I don't see any specifications implied by the character which would lead to these 2 kinds of black. Any idea ? Some ketchup with your "French fries " ? ?